Easy Approval - Order Now! Marinelli 6402E Bb Student Clarinet Description: Bb Student Soprano Clarinet Specs: Heavy Duty Ebonite Body, Double Bladder Pads, Key of Bb, Nickel Plated Keys. Accessories: Hardshell ABS Clarinet Case, Mouthpiece and Reeds. Includes a 3 Year Warranty with purchase. We offer several Rent-To-Own options for this Marinelli Bb Student Clarinet, Rent-To-Own for 12, 24 or 36 Months. 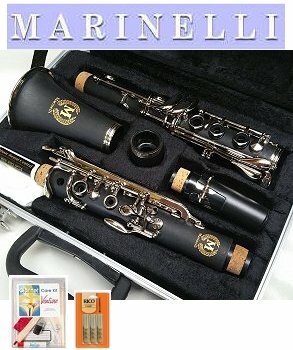 The Marinelli 6402E Student Clarinet is perfect for beginner students in school. Includes all the basic accessories and cleaning materials needed to get started. In house service is covered. Monthly payment and program totals will differ according to the plan you choose. Save money with a larger monthly payment or pay lower rental fees with a longer payment plan. No Obligation, you may cancel and return anytime. *Upfront rental fees are non-refundable. We can ship your Clarinet anywhere in the USA! Order Online Now.